Silver mica capacitors have been widely used as high-performance capacitors over the years. Mica is a group of natural minerals. 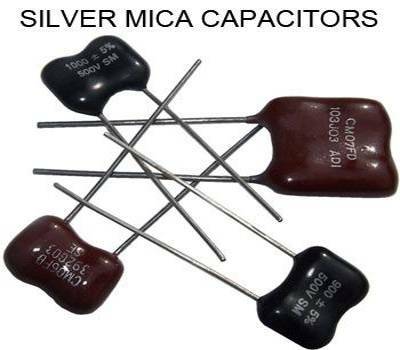 Silver mica capacitors are capacitors which use mica as the dielectric. 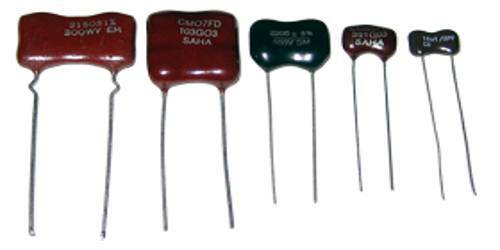 These are high precision, stable and reliable capacitors. They are available in small values and are mostly used at high frequencies and in cases where low losses (high Q) and low capacitor change over the time is desired. Although silver mica capacitors are not as widely used, these days, nevertheless they are still available and used in a variety of applications where their particular properties are needed. The reason for the continued use of silver mica capacitors is the fact that they can offer very high levels of performance, better in many areas than any other type of capacitor. However, in many applications, other more modern technologies provide levels of performance that meet the needs for that particular requirement. High accuracy: Silver mica capacitors can be obtained with tolerance figures of +/- 1%. This is much better than virtually every other form of capacitor available today. Value range: Values for silver mica capacitors are normally in the range between a few picofarads up to two or possibly three thousand picofarads. Low capacitance variation with voltage: Silver mica capacitors exhibit very little voltage dependence. High Q: Silver mica capacitors have very high levels of Q and conversely small power factors. These are both almost independent of frequency. Although silver mica capacitors have a high tolerance and low-temperature co-efficient they are known to jump in value on occasions.